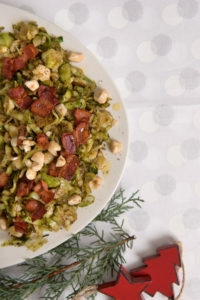 Crispy bacon and toasted hazelnuts dress up this classic holiday vegetable with the right amount of crunch. In a large, non-stick skillet brown the bacon in olive oil over medium-high heat. Remove the bacon from the pan and place on a plate lined with paper towel. Leave the bacon fat in the pan and add the Brussels sprouts, salt, and pepper. Add the broth to deglaze the pan, and simmer over medium heat for about 10 minutes, or until all the broth has evaporated. Add the balsamic vinegar and simmer for 3–5 minutes. Adjust the salt and pepper to taste and spoon into a serving dish. Top with cooked bacon bits and toasted hazelnuts.